SX based 15MHz frequency counter with a PC front end. CRC-32 routine (ethernet, PKZIP) in 76 cycles. Wow. SX based 15 MHz frequency counter. 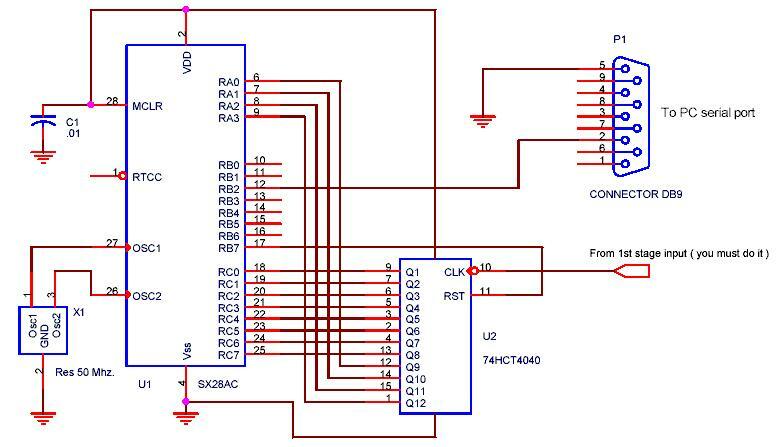 This is a simple frequency counter project based in a SX28 microcontroller from Ubicom. It doesn't try to be an exact instrument measurement, only try to demonstrate, with a very low cost and low quantity of materials, ( only two ICs ) how much we could get from an SX28 plus the RS232 serial port in a PC. Let me to leave to the people who read this article to experiment with it, make some changes, or apply new ideas. If you like you could write to me at SPAMbtxsistemas at ciudad.com.ar . The project is in a basis of two parts, one is the SX code which implement all frequency count, and the RS232 serial communication. The second part is the PC software that only reads the data sent by the SX and shows it in a window of a simulated standard frequency counter. I think that using a different external counter in this project, you could get much more than 15 MHz wide of band for the frequency counter. The signal to be measured need to be an square wave ( you could do this with any schmitt trigger gate ) and it will be the clock for an external counter, that count how many input pulses receive during a exactly elapsed time. This time, is the called "time base" of the frequency counter and its given by the SX software, like this instrument is totally auto-range, the SX software will take more than one measure to know exactly the value of the input frequency, giving in only 12 bits of resolution ( 12 bits external counter ) a complete result in 8 decimal digits in the display. ( PC software display ). How to do this ?, Ok we will take first a 0.5 seconds ( time base ) value of the counter, and after that a 1/4096 seconds value, this two measures will give us, four byte of data to be send to the PC software. And that is all we need, then the PC soft will make some calculation to get the decimal frequency value. clrb	rescount	; finish clr the counter. call	half_sec	; let's the input freq to run the counter for 1/2 sec. mov	data1p,rc	; mov to data1p variable, the content of rb register. mov	data1s,ra	; mov to data1s variable, the content of ra register. call	short_time	; let's the input freq to run the counter for 1/4096 sec. mov	data2p,rc	; mov to data2p variable, the content of rb register. mov	data2s,ra	; mov to data2s variable, the content of ra register. ; at this point we finished to measure the input frequency. Now we'll send it to serial port. and	data1s,#%00001111 ; to avoid the undesired data at high niblle of port RA. and	data2s,#%00001111 ; to avoid the undesired data at high niblle of port RA. ; finished to sent the data to serial port, all begins again. OK at this point we have a lot of different possibilities to change or to add, I think the first and most important to get more speed, for measure higher frequencies, is the change of the external counter, in this project to demonstrate the work, I was using the 74HC4040 which have a 12 bits of resolution, so think about a 16 bits counter to get a 4.29 GHz (theoretical) or real= the maximum input clock frequency. of the counter. You must use (change in SX soft) the entire rb and rc port to read all this 16 bits and let the ra.x bit to implement the serial communication. The PC software was entire programmed in Visual Fox 6.0, the idea was to create an small window into a dialog based application, which shows you the frequency. measured with the hardware. When you start the software, you can see an rectangle window with a pict simulating the frequency counter, it has only two buttons to control it, one is the power button to close the software and the another is the COMX select button to choose which COM port to use. Like we said before, the frequency counter is full auto range and you dont need to make changes in the time base of it, this software will receive four bytes of data every 0.6 seconds ( approximately ) and it will convert it in a big decimal display to be read for you, in the case the hardware is not connected the software will show the display as off; NO error is advised. The software language is only in English version to get Spanish version write to btxsistemas please. NOTE: YOU CAN USE THIS PROJECT ONLY FREE, FOR NON COMMERCIAL PURPOSES WITHOUT MY AUTHORIZATION. Given two registers named "Port" and "Pin". "Port" contains the low byte of the address to one of the IO ports. "Pin" contains a value of 0 to 7 representing a bit of the port register. Scott Datallo posted this solution to the piclist, and after some complaint about how his "obvious" code is totally impossible to understand by anyone else, he even added comments. sb	PIN.$1	;But check to make sure. rlncf   WREG,F        ; then W <<= 1 ( W is now 2 or 8). You'll find an algorithm that implements CRC-32. In fact, it implements crc-32 in 4 different ways, slow and fast bit by bit and slow and fast table reads. If you look closely at these numbers, all sorts of amazing patterns jump out. I've only just now started looking at them and haven't unraveled the underlying symmetry (yet). The brute force implementation to which Tony and I elude, requires building these two arrays bit-by-bit based on the index into the array. For example, the far left column of nibbles is 0,7,e,9,... If you examine the most significant bit of this you'll see 0,0,1,1,.... This bit is the same as the second lsb of the index. In other words, if the index is a nibble, its bits can be labeled i3,i2,i1,i0. The most significant bit of the row array, r31, is simply i1. Where (a,b,c,d) form the four bits of the nibble. Now it's a grind. Meticuously derive the remaining 15 boolean expression, drink a couple of pots of coffee, and a magic pattern will appear before your eyes! ; algorithm(s) in this PIC implementation extend those in reference (2). ; The first extension involves two lookup tables each 16 words long. ;   // fast lookup table algorithm without augmented zero bytes, e.g. used in pkzip. ;   // only usable with polynom orders of 8, 16, 24 or 32.
;   crccol0 = crccol0 ^ crccol0. ; 76 instructions, 76 cycles.